The Space Potatoes, a team of middle-schoolers from Bellevue, Washington, won first place at the 2016 Team America Rocketry Challenge National Finals on May 16, 2016. A team of middle-school students from Washington state will represent the United States at an international rocketry contest in Europe, after taking home the top prize at the 2016 Team America Rocketry Challenge National Finals on May 16. Hailing from Bellevue, Washington, the Space Potatoes rocketry team from Odle Middle School beat out 789 other groups of students from all over the United States. Students Mikaela Ikeda, Larry Jing, Karl Deerkop, Srivatshan Sakthinarayanan and Stephanie Han will share more than $20,000 in scholarships and funds for their school. Team Space Potatoes was one of 100 teams invited to Washington, D.C., to compete in the finals after an initial round of qualifying flights. The students will travel to London in July for the international competition. The winners of the 2016 Team America Rocketry Challenge National Finals included Mikaela Ikeda, Larry Jing, Karl Deerkop, Srivatshan Sakthinarayanan and Stephanie Han. The challenge was to build a rocket that would reach an altitude of 850 feet (259 meters) and safely bring back a payload consisting of two raw eggs, all in less than 46 seconds. Then, the teams were asked to do a second round of launches. In that round, they had to make changes on the spot to show they could adapt to new requirements. 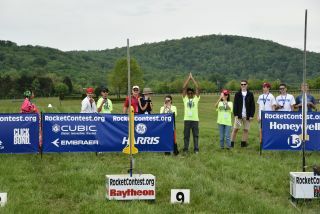 The Team America Rocketry Challenge is sponsored by the Aerospace Industries Association, the National Association of Rocketry, and a number of industry sponsors, including Raytheon, Lockheed Martin and Thales USA. The contest debuted in fall 2002 and was initially intended as a one-time celebration of the centennial of powered flight; however, it proved to be so popular that it was made into a yearly program.